Prince of Peace Donates to Adams County Habitat for Humanity: Front: Pete Ricker, Bill Scott, and Father Herb Sprouse. Middle: Sue Pindle, Judy Leslie, Bill Tyson, John Phillips, Lynn Cairns. Back: Bill Leslie, Bob Boehner. The all-volunteer, non-profit organization Adams County Habitat for Humanity accepted checks and thanked three major contributors following its April Board of Directors meeting. Donors included Prince of Peace Episcopal Church, Gettysburg; ACNB Bank; and the kindergarten classroom of Mrs. Brittany Lawrence at Gettysburg Montessori School. 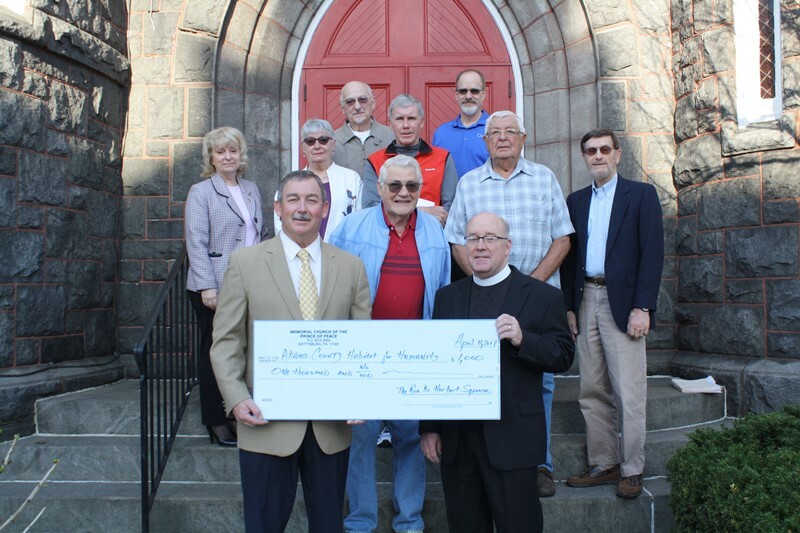 Prince of Peace Episcopal, one of 14 covenant churches connected to Adams County Habitat, made a contribution of $1,000 to the organization. Father Herb Sprouse represented the church at the presentation. 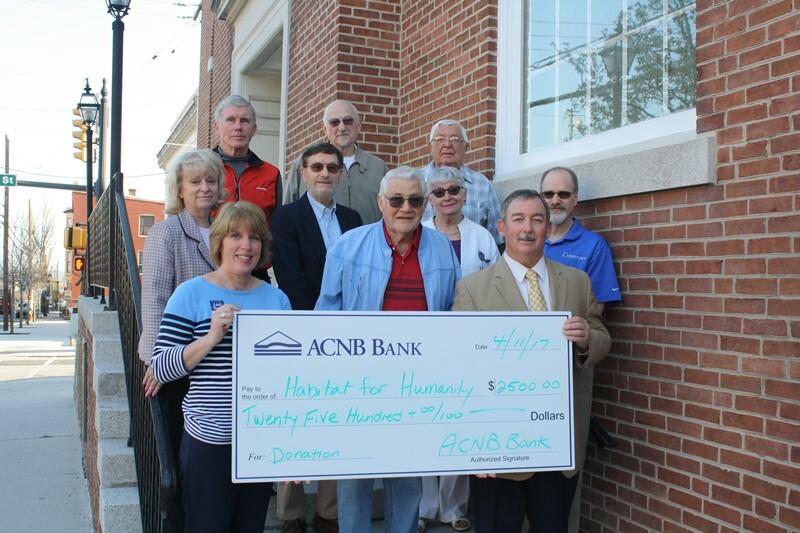 ACNB Bank, a long-time corporate donor, presented Adams County Habitat with a 2017 donation of $2,500 through Vice President and Corporate Relations Officer Lauren Muzzy. ACNB Bank Donation Benefits Adams County Habitat for Humanity: Front: Lauren Muzzy of ACNB Bank, with Habitat Board Members Bill Scott, Pete Ricker. Middle: Sue Pindle, Lynn Cairns, Judy Leslie, Bob Boehner. Back: Bill Tyson, Bill Leslie, John Phillips. Additionally, the kindergarten class of Mrs. Brittany Lawrence at Gettysburg Montessori School voted and designated Adams County Habitat for Humanity as the focus of their recent giving project. Lawrence said her students felt compelled to help and donate, when they learned there are Adams County families in need of homes. 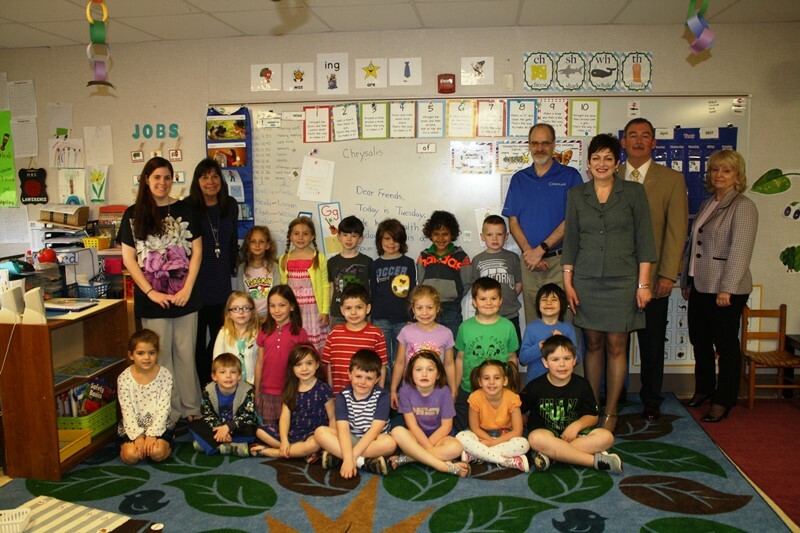 Kindergartners Help Adams County Habitat for Humanity Via Donation: The kindergarten class of Mrs. Brittney Lawrence, Gettysburg Montessori School, is photographed with: Left: Mrs. Lawrence and assistant teacher Ann Wright. Right: Adams County Habitat for Humanity Board Member Bob Boehner, school principal Faye Pleso, and board members Pete Ricker and Sue Pindle. Adams County Habitat for Humanity, founded in 1988, completed and dedicated its 39th home in the fall of 2016. The organization will be announcing plans for its banner 40th home, this spring. The majority of each Habitat home’s construction is completed by volunteers, side-by-side with partner Habitat families, as well as skilled laborers—many of whom donate or discount their services. Costs are kept as low as possible so that homes are affordable to partner families. Prospective homeowners are encouraged to apply for a home. Habitat for Humanity offers interest-free mortgages to those who qualify. Applications for future homes will be available at the open house and are also available online at www.habitatadamspa.org. Tax-deductible donations are always welcome, via online giving at www.habitatadamspa.org or checks mailed to the organization at P.O. Box 3561, Gettysburg, PA 17325. 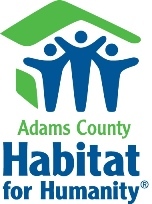 To volunteer with Adams County Habitat for Humanity, contact volunteer committee chair Bob Remaley at coachremaley@comcast.net. For more information, check the Adams County Habitat for Humanity Facebook page at www.facebook.com/adamscountyhabitat, the website at www.habitatadamspa.org, or call 717-334-5557. Adams County Habitat for Humanity follows the vision of Habitat for Humanity International: A world where everyone has a decent place to live. And the mission of Habitat for Humanity International is as follows: Seeking to put God’s love into action, Habitat for Humanity brings people together to build homes, communities and hope.